A picture of what working in SMS looks like. In working along with my supervisor, I have been able to get a feel for yield data cleaning. It is a very important part in the Nrich strip project. A yield monitor is used on the harvester to record the information. But the yield is not totally until it is cleaned. The raw data arrives from the farm and is then loaded into SMS. SMS is the software that is used to configure the field boundaries. The files are then transferred to a software called Yield Editor. The moisture and flow delays are checked and any outlying values are deleted. Once a field has its yearly yield data cleaned it is ready to be used in Arcmap. 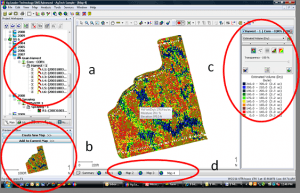 By using classify and raster calculator tools, the quadrant is made to evaluate the best area for Nrich implementation. Showing the new drone before the first flight. Well, a new drone finally arrived! It’s really exciting to see the new drone fly in the air. The speed is remarkable. It requires only a few presses of the button on the tablet to fly. 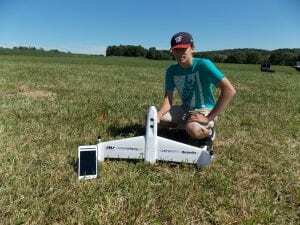 It took eleven minutes to fly a 105 acre field. During the flights, the camera records Normal Digital Vegetative Index. The values will be used in a formula to predict yield. The best time for flying is when the plants are at stage V12 in order to draw the most accurate estimates.